This product is available at Banggood, Aliexpress, Amazon.com, Ebay. 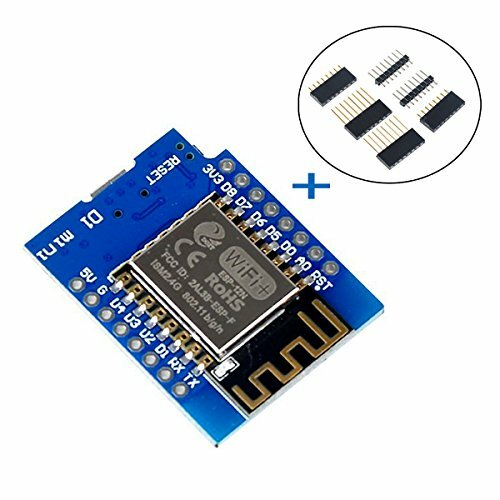 At banggood.com you can purchase WeMos® D1 mini V2.2.0 WIFI Internet Development Board Based ESP8266 4MB FLASH ESP-12S Chip for only $2.99, which is 70% less than the cost in Amazon.com ($9.99). The lowest price of Makerfocus D1 Mini NodeMcu 4M Bytes Lua WIFI Development Board Base on ESP8266 ESP-12F N Compatible NodeMcu Arduino was obtained on 9 February 2019 2 h 05 min. The WeMos d1 mini is an ESP8266 development board that is compact, versatile and very easy to use with the Arduino IDE or PlatformIO IDE. It is supported natively by the Espressive SDK. The advantage of the WeMos d1 mini compared to other ESP8266 development boards lies in the many expansion cards (shields) developed by the Chinese company Wemos.cc. There is a shield to meet virtually every need. There is also a Pro version of the d1 mini. Even finer, it has an IPEX connector to connect an external WiFi antenna to increase the transmission / reception range. It also has 16MB of flash memory instead of 4MB for the standard version. Only memory, the entire flash memory is not yet supported by the Espressive SDK and the Arduino IDE. All shields developed for the d1 mini are compatible with the Pro version. You can find the WeMos d1 min Pro at the best price online. To start the development of connected objects or accessories for your home automation server, you will find many examples and tutorials here. You can start by reading this tutorial if you start programming ESP8266 modules with Arduino code. If you have never programmed, you can install the ESP Easy firmware and make your temperature probes, make displays, order your roller shutters … without programming. Follow this comprehensive guide to install ESP Easy on the WeMos d1 mini and trade your first project.